Congratulations to all students who worked on last year's literary magazine as typists, artists, and selection staff members, and to all students who had their writing published in it. 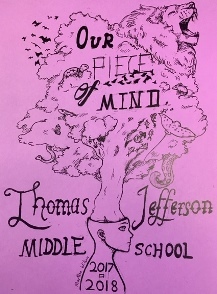 Our school's literary magazine, Our Piece of Mind, has been selected to receive a rank of Excellent in the 2018 NCTE Recognizing Excellence in Art and Literary Magazines (REALM) Program. The mission of NCTE's Program is to publicly recognize excellent literary magazines produced by students with the support of their teachers and to encourage all schools to develop literary magazines that celebrate the art and craft of writing. Special acknowledgement goes out to Molly Doherty, Elena Engel, and Elizabeth Roth, who are currently in ninth grade but served as editors for last year's magazine. Check out the other great things happening in the Writing Lab!